RHAM would like to recognize and THANK our 2017 sponsors! We couldn't do it without them. Advertising with RHAM supports the funding of awards given to members throughout the year for their achievements. For the past 25 years, Christy has been involved in making life better for horses. she has learned much from them and wish to return their wisdom to them in the form of better care and fuller lives for the horses and their caregivers, trainers, and owners. Learning is lifelong and benefits us all. Dave mccartney is located in Cassopolis, MI and offers training, lessons and clinics. Our compassionate and experienced veterinarians are available 24/7/365 for your horse and livestock needs. We provide equine and large animal veterinary care to southwest Michigan and northern Indiana. Matt's horsemanship skills and coaching abilities are shown at every RHAM show as he helps riders of all ability levels in their cattle classes. Matt's willingness to share his knowledge in clinics and shows is greatly appreciated by many rham members. LOCATED IN PAW PAW, MI, THE DANIEL HEALTH CHALLENGE PROVIDES HEALTHY MEALS, SNACKS AND DRINKS. CHECK OUT THEIR NEW ENERGY DRINK…. NEON HAS NATURAL INGREDIENTS WITH ALL YOU DAILY B VITAMINS. THE ENERGY DRINK THAT IS WORTH DRINKING.THE DANIEL HEALTH CHALLENGE PROVIDES HEALTHY MEALS, SNACKS AND DRINKS. CHECK OUT THEIR NEW ENERGY DRINK…. NEON HAS NATURAL INGREDIENTS WITH ALL YOU DAILY B VITAMINS. THE ENERGY DRINK THAT IS WORTH DRINKING. 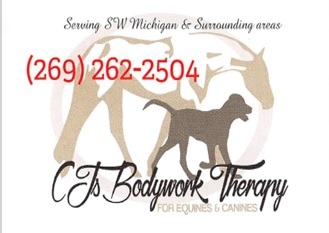 Pampering pets in Berrien County for over 19 years. Good, clean, quality animal bedding. minimal dust. Mostly pine. NO nut wood. 15 yard and 17 yard trailer loads available for delivery. Miller saddlery located in Goshen, In makes saddles, chinks, chaps, reins and many other leather products. Shop in the store or order your custom leather goods.